In June 2016 I spent two weeks touring on the Pacific Coast. A leisurely tour, the emphasize was on the scenery, the environments and contemplation. As usual I blogged the tour here as it went on the links of which I have collected here. Additionally I took over a thousand photos on this tour and a selection of these from each day have been uploaded to Flickr. Links to each days photos are included here along with each days report. I made one last stop in The Whit at the New Day Bakery – which was great – before I made my way to the Amtrak Station. This being the beginning of the Amtrak Cascades route the train was ready and waiting for me. I pulled off my bicycle bags and helped the porter left it into the baggage car. I found a seat with a table where I would spend the next seven hours. It was a fine day with cloud strewn skies and plenty to watch as the train made its way north: Mount Hood, Mount Adams, Mount Saint Helens and finally Mount Rainier. When I finally got off the train and reattached my bags it was late afternoon. It felt good to do even the short ride home after seven hours on the train. Back home I unloaded the bicycle, put everything way, cleaned up and cooked some dinner. As the sun set over the city long spine-like clouds lit up with dark purples, reds and oranges. Tomorrow is the first day of summer. On this day I would leave 101 for the first time since joining it in SW Washington. I was riding to Eugene which was a fair piece and since I desired to spend some time in the city I left early. It was partially blue skids when I left camp but it clouded up as I made my way north (still on 101 for the time being) to Florence. I began to hear thunder in the distance. Big, threatening clouds rolled in and fat drops of rain began to fall. I quickly made my way to Natural Market and Cafe, where I had more coffee and a second breakfast. While I was here the storm passed right overhead – lightning flashes followed by thunder almost right away, which would shake the glass of the windows. It poured rain which was whipped around by the winds. Pretty Dramatic. But soon enough it had roared by and the blue skies were back and things began to dry out. I had put my bicycle under an overhang and had missed the bulk of the rain so I was nice and dry. But I’d lost that early start. So I hit the road and quickly turned onto Hwy 126 which I’d be following all the way to Eugene. It began with a flat fifteen miles or so right along the Siuslaw River. The shoulder was good, the road flat but lots of traffic., more heading west than east, but still pretty busy. But in the main this was good riding. At the tiny burg of Mapleton hwy 36 split off and the road headed into the, well not quite mountains, hills maybe? The shoulder faded away and it had the feel of a paved forest road. If it wasn’t for the traffic, which didn’t really let up, this would be my kind of riding. I still enjoyed being right in the trees and the many little rocky brooks that the road croused over and often followed along. There was a good long ascent, not to any really epic elegation but it went on for a long time. And then there was a tunnel. The hill actually crested right at the end of the tunnel. This of course was followed by a descent into a forest valley. I’d almost caught up with the thunderstorm and the roads were wet and ahead I could see the storm clouds ahead and to the north. But it outpaced me, or moved north and I was riding under blue skies with these big cotton ball like clouds. The winds were out of the west as usual and helped push me along. There was another long climb out of the forest valley this one actually had an elevation sign at the top: 756 feet. Made me smile. This was followed by a long descent into the Wilamette Valley which I’d be riding in the rest of the way to Eugene. The valley was farmland at first and then wineries showed up as I came into Veneta. From that point on it was fast traffic and lots of it and the road both deteriorated in quality and the shoulder bexams rather minimal. I went through this vast wetland of the Fern Ridge Wildlife Area which once I exited I was in the edge city portion of Eugene. A sign pointed me toward the Fern Ridge Trail which I was able to ride most of the way to my hotel. Leaving the trail I rode through residential streets filled with funky little houses and streets with lots of life. My hotel turned out to be right on the edge of the Whiteaker Neighborhood (“The Whit”) of Eugene, which is clearly a funky, happening area. Art, tons of foodie type restaurants, coffee houses with character, breweries, all in the midst of those unique houses and a lively neighborhood. Nice. I’d arrived late afternoon and I was able to spend about five hours walking around this area, checking out various places and enjoying the vibe. As I walked back to my hotel, the sun was setting, lighting up the lingering clouds. I crossed a set of tracks and as I did the Amtrack Cascades went by. Tomorrow morning I’d be on that train. Umpqua Lighthouse State Park was the southern most extent of my journeys. In fact I had gone beyond the road where I needed to start heading east. So this day requires back tracking north for a ways. But I was going to camp just before the turn east so this was going to be a short days ride. 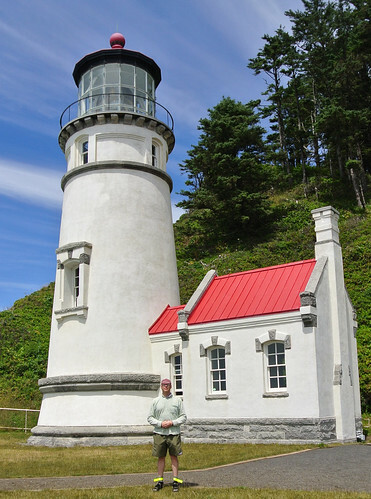 I began by heading down to the Umpqua River Lighthouse. This was the sixth lighthouse I’ve checked out this trip. Almost a lighthouse themed tour, which one could easily do in OR as they continue to be present as you move down the coast. From the lighthouse I found a backroad that let me skip the climb out of the campground, which on reaching 101 would just descend. In steam I took a nice pleasant road to the banks of the Umpqua and rode along the river to Wincehester Bay. Then it was on 101 with its rolling hills until Reedsport where I stopped at Jitterbug N’ Java. A really interesting coffee shop it had a dance floor and stage fully loaded up with instruments. They did live music and jam sessions along with dancing. I lingered over lunch there before returning to the road. Apart from the typical northerly winds this was excellent riding weather. Blue skies, clouds blowing by, warm but not hot. There was the long climb up to the clearcuts and along the way I noticed a tiger swallowtail struggling on the shoulder. I pulled over and grabbing a stick helped it walk onto it. Then I transferred it to a stalk of grass – these big winged butterflies can’t take off from the ground. It immediately flew off and crashed right into the road. I rescued it again, and this time holding the stick aloft it flew off and wobbled across the road. On the other side it randomly encountered another Tiger Swallowtail and they began that timeless dance. At the top of the hill I stopped to look at the clearcuts. On the other side of the road I go down a short access road and there, beyond the clearcuts is woods and hills as far as I can see. Nestled in a valley is a lake, the north end completely wooded with the exception of a train trestle running across and one solitary cabin. Now it was the descent from the hill, and riding in the National Forest land amidst the lakes. There was also a long stretch of roadwork in progress but like yesterday they were actively working on it. Then pretty early still in the afternoon I came to Honeyman State Park. This is on the Oregon Dunes and after situating myself I hiked to the edge up the dunes and up the fine sands. Far in the distance I was able to see the ocean. The last sighting of the pacific this trip. This day was mostly clear, with an unusual southerly wind blowing white streamers of clouds across the blue canvas. On the road I almost immediately reached Yachats where I stopped at the Bread & Roses Bakery and lingered over their fine coffee and baked goods. Departing I found my rear tire flat. I fixed that in Yacharts but all of this found me fairly late on the road. And this was going to prove to be one of the most memorable stretches of the coast. I continued to crawl up the cape, which went up and down and had an overlook every quarter mile or so. One of these had a rocky sealevel shore with a hole in it where the wave action made a natural waterspout. Another area sealions would come in to rest. Everywhere there was these stunning views of the rocky shore, the blue ocean, and the white streaked sky. Making my way to Heceta Head, there was the turn off for the lighthouse. This road descended right down to the water and then there was a half mile trail right back up to the headlands. “No motor vehicles” was posted but it said nothing about bicycles. So I rode the gravel trail up to the lighthouse. As I arrived the volunteer tour guides noted that was the smart way to do it. A classic lighthouse right on the edge of the coast, it cuts a dramatic figure against the blue sky. Leaving the lighthouse I found there was a back road from the keepers house to 101 that let me avoid the long descent and climb back up! Just past the lighthouse 101 crosses a stone bridge and then goes into a short tunnel. Uphill of course! Then it hugs the coast line for a spell and then climbs up to the Sealion Caves. I was able to check out the sealions and a lot of birds before the official attraction so I didn’t go in. But from here the coast dramatically changes. It becomes quite linear and all sand dunes. 101 goes inland and I would be away from the coast for a while. It had taken me hours to do this 20km stretch of coast so it was pretty late when came into Florence. I got some supplies and then had to really make time to my destination. The road was all through trees now and coastal forest lakes. A long stretch of National Forest Land there was quite a few campgrounds, boat launches and recreational areas. There was a good long climb through the trees which culiminated in a massive clearcuts. But then it was a descent to the Umpqua River which I crossed via two bridges into Rockport. A couple more ascents and descents as 101 cut off the mouth of the river and I came to Umpqua Lighthouse State Park where I would rest after this epic day. It rained all night only ceasing upon the dawn. So it was a damp morning of packing as I broke camp and headed south. A scant distance Down 101 I came to Newport and the turnoff to Yaquina Head Lighthouse. A classic lightouse right at the end of the headlands overlooking the dramatic and rocky coast. There were vast amounts of birds nesting on the rocks and a young bald eagle was also sitting there digesting one of those birds. I arrived at Beachside State Park which is in a little strip of trees right between the beach and 101. The Hiker/Biker site is right near the entrance in a little stand of trees. A path through those trees led to an unofficial beach access point. My own private beach. The clouds were dramatic, torn up like sea foam. In the distance was a massive cloud with tendrils reaching down to the ocean as it shed rain. That I imagine would make landfall in a couple of hours. The wrack of clouds made for a particularly dramatic sunset, reflected in the wet beach. This was another day predicted to be filled with a series of fronts moving through so I decided to stay at Bevery Beach Campground and explore the coast. Considering that I’d moved along this section of the coast pretty fast yesterday Ithis would give me a chance to check out what I missed. As I left 101 to Otter Crest the clouds that had been threatening rolled in and the rain began to come down. As I turned down the road to the Devils Punchbowl the skies opened up and fell upon me. It shortly turned to hail. Happily it was only a couple of blocks to the State Park where I took refuge at the bathroom. The downpour only lasted about 15 minutes and then the front had moved by and the sun would come out. This would be the pattern most of this day. The Devils Punchbowl is a bowl shaped opening in the coastal rocks with gaps to the ocean. The continous action of the surf shoots into these opening creating a churning tidal Punchbowl. The tide wasn’t super high but it was pretty neat. The views of the coast here and along the other lookouts at Otter Crest were just completely stunning. I rode into Depoe Bay and had lunch and acquired some essential supplies. During lunch there was another downpour which again really came down for fifteen minutes or so and then moved on. I looked around the shops in town but there was nothing that struck my fancy (or I could carry). So I rode a bit more north to Boiler Bay which I skipped yesterday. Another great overlook of the sea eaten coastline. Then it was just making my way south again, taking my time along Otter Crest Loop. I awoke to the sound of drizzle pitter pattering on my tent. Now the sound of rain on the tent is an experience not to be missed, but I did intend to pack up and leave Cape Lookout today. It fell off after a spell and I jumped out and put everything I way. Then I moved to the campgrounds covered pavilion where I made breakfast as the rain really came down. But it didn’t last and my weather app said it would be mostly just overcast the rest of the day. Heading south now on the Three Capes Route I found that just past the State Park was the most devastating clearcut I’ve seen on this tour. What was once a beautiful corridor of trees is now cut short on one side and just a barren, brutalized hill. Recent enough too that wildflowers or undergrowth had yet to move in. As always when I’m shocked by clearcuts I have to ask myself, “what am I doing to reduce my consumption of wood products?” If there was no demand there’d be no clearcuts. Just past the clearcut is the longest climb of the Oregon Coast. While never very steep it climbs over 800′; almost twice that as the climb to Cape Mears I did yesterday. Of course compared to virtually any mountain pass it is just a bump, but for the coast it is a climb. The drizzle returned as I mde my ascent and I donned rain gear before the descent. But by the time I’d wound my way back to the coast at the long sandy beaches at Cape Kiwanda (the third Cape!) it had cleared up and off went the rain gear. I followed the beaches for a while, stopping for lunch in Pacific City. The route then turned inland and left 101 on one of my favorite bits of riding: Old Scenic 101. A ten mile strench, it actually adds miles from the more direct 101, but it is in old trees, along a stream and mostly forestland. Not much traffic and only at the northern end are there houses, which mostly seem to be old school hippies. But back on the main roads I find the character of 101 had really changed. A lot more traffic and two lanes as I came into Lincoln City. The route take you on the east side of Devils Lake to avoid Lincoln City, but the road was closed for construction. So I continued on 101 through town. You can see why it avoids it – busy, the shoulder goes away and there is a solid mile or two of edge city followed by a tourist trap section of cotton candy, bead shops and other tat. Just past this was the turnoff to Devils Lake Campground where I was making for this day. It turned out to be a scant block from 101 and the hiker/biker section was literally on a residential street fully open to houses next door. Though it was getting on I decided to press on to the next campground. Once fully outside of Lincoln City environs there is one of the absolute best sections of the coast. From Boiler Bay to Newport the coast is all wave carved rocks and weather eaten bluffs. The biking route is as good as it gets too as while 101 climbs a steep bluff, the OR Coast Bicycle Route takes Otter Crest Loop, a narrow road with only one way traffic and a bicycle lane. This hugs the edge of the bluff and the views into Depoe Bay, Cape Foulweather and Yaquina Head are just stunning. There was clearly rain coming in but I only felt a few sprinkles on this bit. Soon enough the road descended back to open sandy beaches where Beaverly Beach State Park is and I would camp this evening. Within a couple hours of my arrival the rain put in an appearance. I decided to stay another night at Cape Lookout, so that I could explore Cape Mears which I’d missed yesterday. Taking a leisurely morning I enjoyed the first bright blue dawn in a couple of days. The sun was already quite warm as I made my way back along the Three Capes Route. The tide was out in Netarts Bay and flocks of seagulls, cormorants wheeled over the windswept mudflats. Great Blue Herons as still as the standing rocks pointing out of the crystal blue seas. The wind was against me riding north but in the morning it is pretty minimal. A lovely ride all around. In Netarts I stopped for lunch and in talking to the cafe owner I found that the “closed” part of the Three Capes Route may be opened for exclusively cyclist use. There road had been partially wiped out by a mudslide and it’s right on the edge of the rock so not much rebuilding. But sounds like a bicycle can get through and they already are. So I could have done it – the risk would have paid off. So it goes. Leaving the cafe in the afternoon the wind had really picked up. The road up to Cape Mears went up the rocks and down into coves concluding with a full 2k climb to the lighthouse turnoff. With the strong afternoon wind and constant traffic this would be a preferable northbound route! The road descends to the Lighthouse which was packed with visitors. I took the trail down to the lighthouse, which is at about the height of the lighthouse itself. What I really enjoyed was the scenic overlooks, where you’d stand in the hard blowing wind gazing out at lumps of rocks poking out of the blue waters and birds flying everywhere. At the head of the cape you could stare out to where the rippling blue of the ocean meets the blue gradient of the sky. The lighthouse itself is a charming relic of the past. I do though wish that lighthouse keeper was a viable occupation… After the lighthouse I walked around the cape some more, checked out the Octopus Tree and then made my way back. Again a lovely ride along the capes this time blown along by the strong winds. That evening I was treated to a lovely sunset, an ideal nightcap to a perfect Oregon Coast day. There was some early morning rain but then the front moved by and the sun cand out. I lingered in camp, drying out and recombobulating things. So it was nice and warm when I returned to the road and continued drifting south. The wind was with me, pushing me and the occasional stray cloud down the coast. I rode steadily for about an hour and then I was at Rockaway Beach where I stopped for lunch. I lingered at Rockaway beach, checking out the town, taking care of some business. This really is the first day that I’ve been able to tour as I’ve intended this time. No pressure, low miles, really checking things out. What also has been really welcome this tour is all those little things that can grate on one – trash, roadkill, edge city, difficult people aneed so on – and tend to lead to some down moments, none of that seems to have any purchase. Leaving Rockaway Beach the route rolls up and down the rocky promontories and through various little one horse towns. At least until we come to Tilamook. There is of course the famous cheese factory – I felt little compunction to visit and just took a picture and continued on my way – juse outside of the town proper. Real feeling of a farmers town with tourist attractions. The route now turns west into the wind. But not for long, as I came to the start of the Three Capes Route there was a sign warning that the road was closed six miles ahead. My maps have an alternative at this point to follow hwy 131 which cuts off Cape Mears. I’m often willing to take closed roads and see if there is a way for a bicycle to ride around, but six miles is a long way to go to find that out. So the direct route it was. The direct route more or less went through clearcuts, had no shoulder and was more heavily trafficked. It also had the only long climb of the day. It rejoined the Three Capes Routs with a descending series of rollers. Back with the wind I rode along Netarts Bay, which was beautiful riding. Right on the water, which was aquamarine with white sandbars poking out of it with the arms of Cape Mear and Cape Lookout encircling it. With a bit of an ascent into the woods I left the bay and soon reached Cape Lookout State Park. I’d arrived early due to taking the cutoff route and thus I had plenty of time here. The hiker/biker sites are in a little stand of trees right above the beach. The continuous sound of the waves rolling in and out would gently accompany ones slumber.